check the impact of the new 13×5 prop on endurance. Weather on the day was not ideal, with light rain (evident on the camera lens in the photo below) and wind averaging 10m/s with gusts of up to 15m/s. This was on the upper end of what we’d aim to fly in, considering the OBC doesn’t require take-off if wind is above 7m/s. We had some difficulty enabling logging from the I/O boards: I had changed the GPS drivers to report velocity in NED—converted from ECEF within the driver—but had neglected to test the conversion with live GPS data, and of course it failed miserably. After switching the firmware back to ECEF and re-flashing the two boards in the field, the status lights indicated all sensors OK and the log process on the ODROID-X2 indicated data was being received, so we continued with the launch. The winds were clearly close to the limit of what the airframe could cope with; we observed significant pitch and yaw instability, and when flying into the wind at cruise speed, the ground speed was barely walking pace. 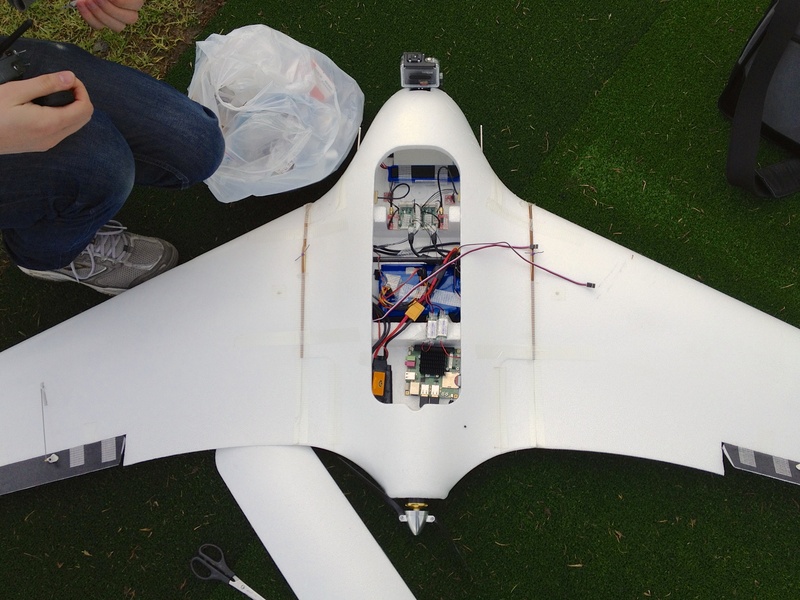 However, after a 10-minute flight and a successful (albeit hard) landing, we had enough data to meet our requirements. One problem we found was that the ESC overheated, cutting output power to 40% and preventing the X8 from making progress into the wind. 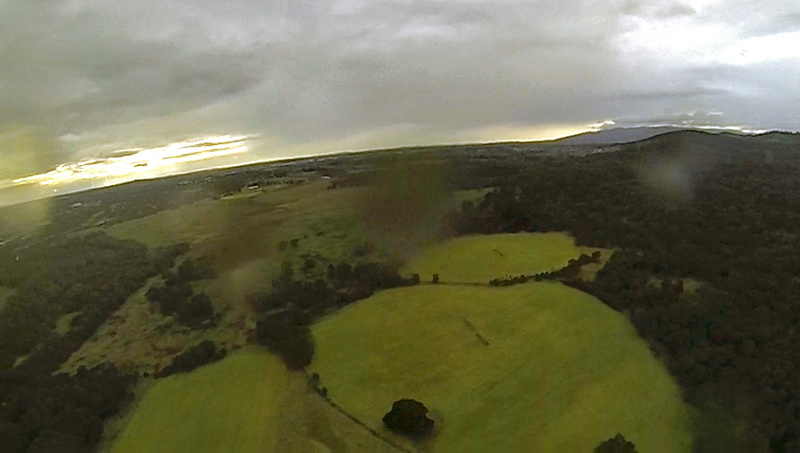 This cut the flight somewhat shorter than it would otherwise have been, although the rain and wind would have precluded a full endurance test. The 10-minute flight consumed 40% of the 8.4Ah battery, representing somewhat worse endurance than the previous flights, as expected given the need to increase throttle to 70% or so while flying into the wind. 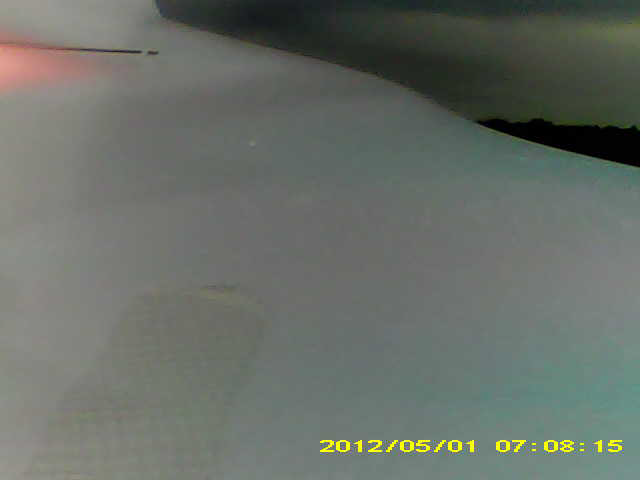 Unfortunately the videos from the keychain cameras were unusable due to the limited FOV (see image below); for the next flight we will investigate alternate mounting points, for instance on the wingtips facing towards the fuselage. The GoPro, however, worked extremely well, recording 240fps at 848×480 and enabling assessment of the accuracy of the UKF attitude output (after accounting for bias) to within a degree or two.